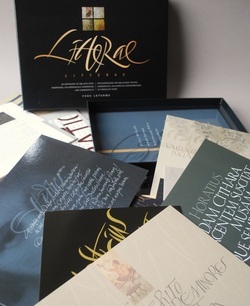 Like a precious small chocolate box, your collection of Latin quotations lies on my table. I dare not eat too much of it at once. Quel surprise, quel travail, élégance et quel abattement: que veux-tu que nous fassions après ça? What an enormous project. It is an excellent integration of so many things, your intellectual and calligraphic interests, technology and craft, design and content. The concept of the box is genial, everything so well designed, written, researched, translated - really a precious object to enjoy every day. It's an inspiration in design and colours. Congratulations!!! It is a huge present you gave to all of us and I can´t decide what is more important: the selection of texts, the calligraphic interpretation or the little book of comments. ​Your boxes arrived. One monosyllabic response - WOW!